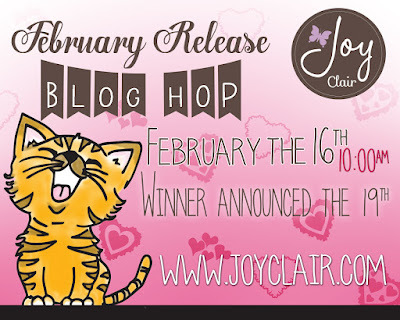 It is Blog Hop day with Joy Clair and you should have arrived here from the wonderful blog of Leah. Eight new stamp sets this month and along the hop you will being seeing all of them. 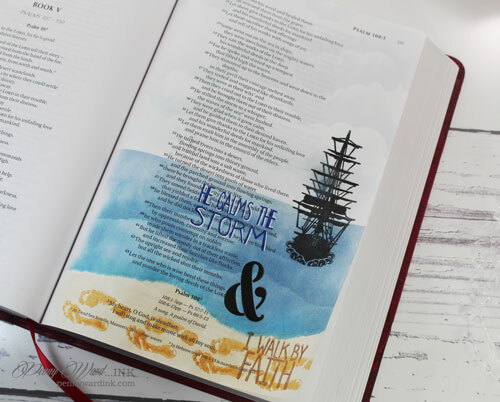 I have used two of the new stamp sets on my projects today, both in my Bible journaling. I have to tell you, I am really loving this new way of expressing my art. To achieve this page I used the new All Things Possible stamp set. Sky is done with a torn piece of paper for a mask and swiping VersaMagic Aspen Mist ink. Ship is stamped with StazOn Jet Black ink. Sand is Tea Dye and feet are inked with Peanut Brittle. Once the top sentiment was dry I used a White Gel Pen to outline the letters. Ok...I mean really, how cute is this new Let That Light Shine stamp?!? Stamp light bulbs with StazOn Jet Black ink, then color with Yellow Pan Pastels, and stamp word in each bulb. "rays" around the bulbs were done with a Yellow Highlighter and a Gold Sharpie. The chains were a matter of a ruler and a Black Pitt Artist Pen making dots. I did outline the bottom bulb with some colorful GellyRoll pens. I drew the Highlighter, colored with Yellow and Orange Pan Pastels. One Lucky person will win the COMPLETE February release. 6. 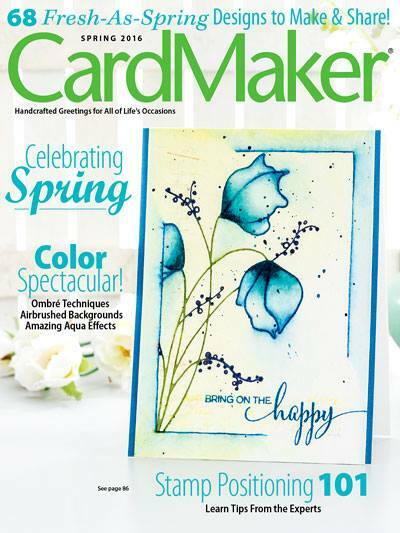 Follow Joy Clair on Pinterest and pin your favorite card. 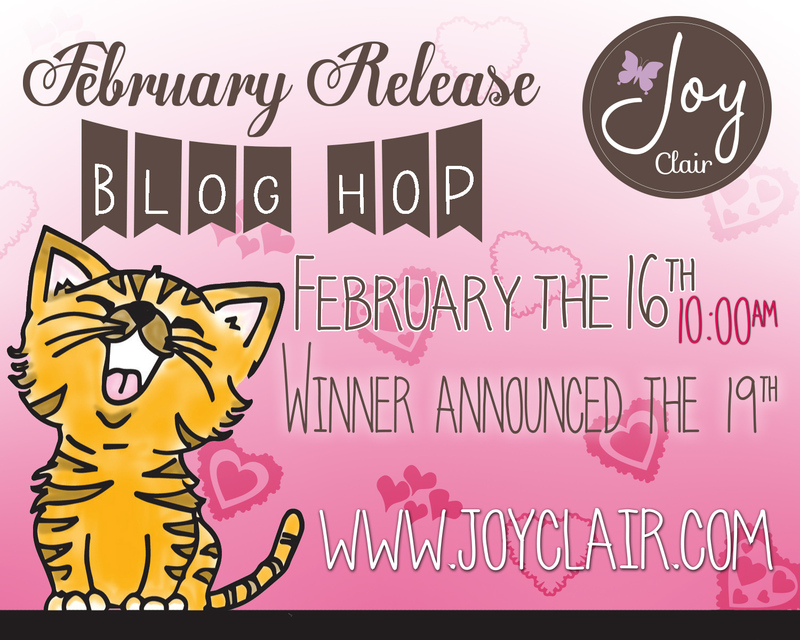 You have until Noon February 19th (EST) to enter for the chance to win the ENTIRE February release. I hope you enjoyed my interpretation of the new stamps sets today. You have completed the Blog Hop, but if you need to start at the beginning, click HERE. I am so inspired by your Bible art! Can't wait to give it a try .. my journaling Bible won't arrive til late March!! 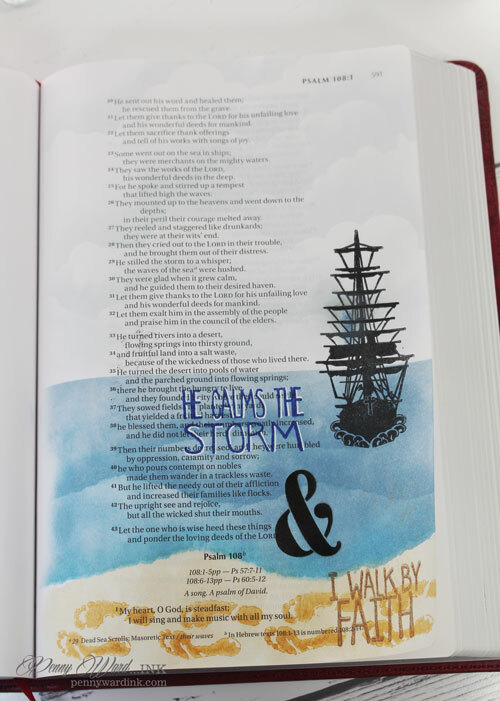 Loving your Bible journaling - fabulous. Awesome, the depth you created on your first entry! 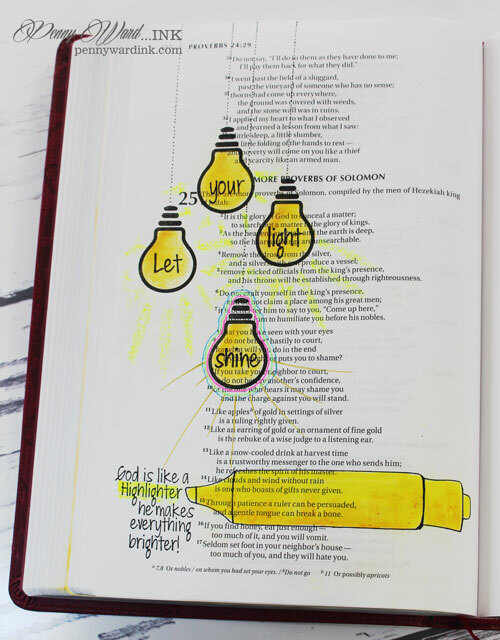 Beautiful Bible journal pages, love the bright colors. I love that Bible journaling. Really awesome! great job. i really like them. and it has been a very nice hop. Just wow...makes me want to copy your idea in my bible journal. Lovely journalling! The light bulbs are awesome!